All three books are available for sale individually or as a box set . Henry de Grey leaves Southampton in high spirits, strong in his faith and passionate about the mi ssion to take Jerusalem back from Saladin’s army. Stephan l’Aigle’s prowess on the battlefield is well known, as are his exploits in the arms of other men. He prizes duty, honour and loyalty to his king above all else. But God and the Church? Stephan has little use for either. A 2014 B.R.A.G. Medallion honoree and Readers’ Favorite. Smashwords, Barnes & Noble, Kobo, AppleBooks, and other online retailers. Stephan l’Aigle is the third son of a Yorkshire baron with no hopes of inheriting land or titles, probably a good thing as he has no interest in women, nor any desire to marry or produce heirs. Stephan finds pleasure in the arms of other men. Eighteen years old and recently knighted, he must make his living on the tournament circuit or become a soldier for hire. His life will be forever changed when Richard, Duke of Aquitaine & son of King Henry II, sees his skills in battle. NOTE: this is not an HEA. I’d say it’s bittersweet. This short story is a prequel to Men of the Cross and will be an exclusive for subscribers to my Newsletter in late 2018. 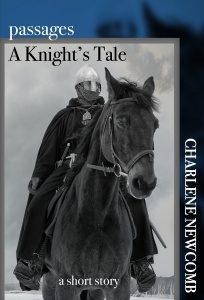 So sign up for my newsletter to receive the ebook, A Knight’s Tale. The story won’t be published on retailers’ sites until summer 2019.